I love the Somerville Winter Farmer’s Market. 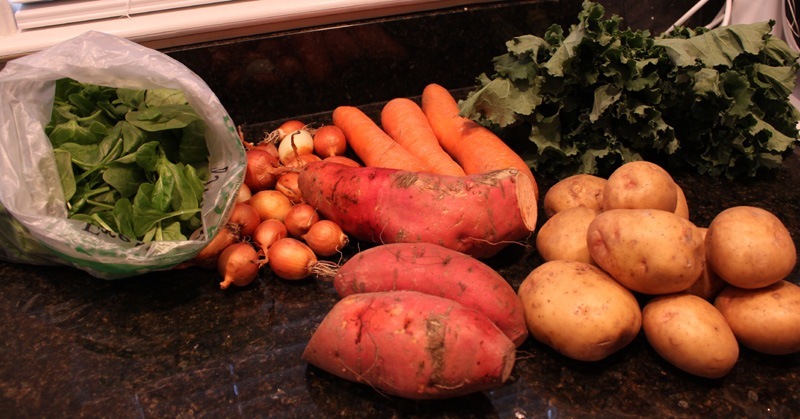 I went a few weeks back and loaded up on an abundance of fresh produce (spinach, kale, onions, potatoes, and carrots). I knew I wanted to make latkes with the potatoes and was excited to blend two different kinds into one recipe. Recipe Note: The recipe calls for 3 potatoes and clearly in the pictures I processed the whole lot of them that I bought. 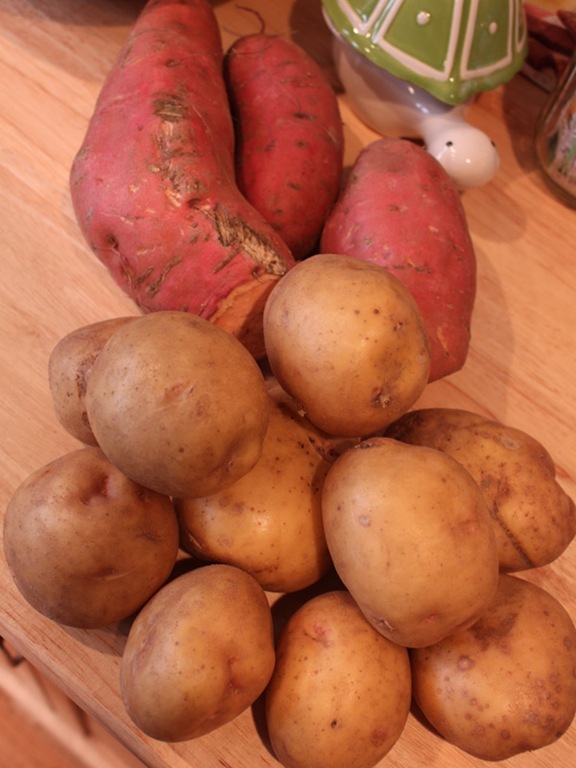 The pictures are just for illustrative purposes, stick with the 3 potatoes that the recipe calls for. 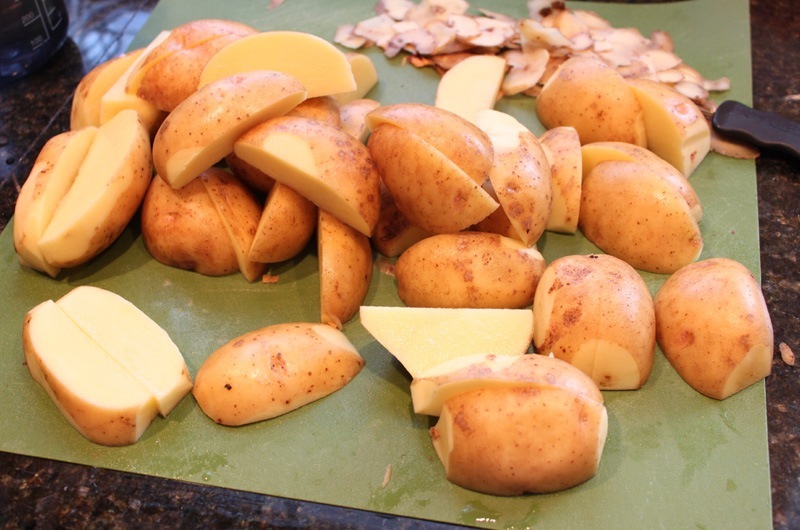 Your 3 potatoes should yield 2-3 cups grated and that is the ratio this recipe is based on. 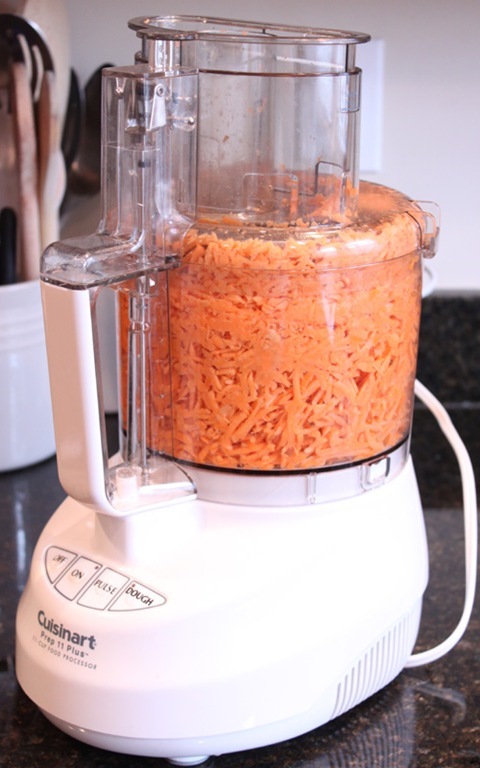 The first step is to process all of your potatoes – wash, peel, grate in your food processor. 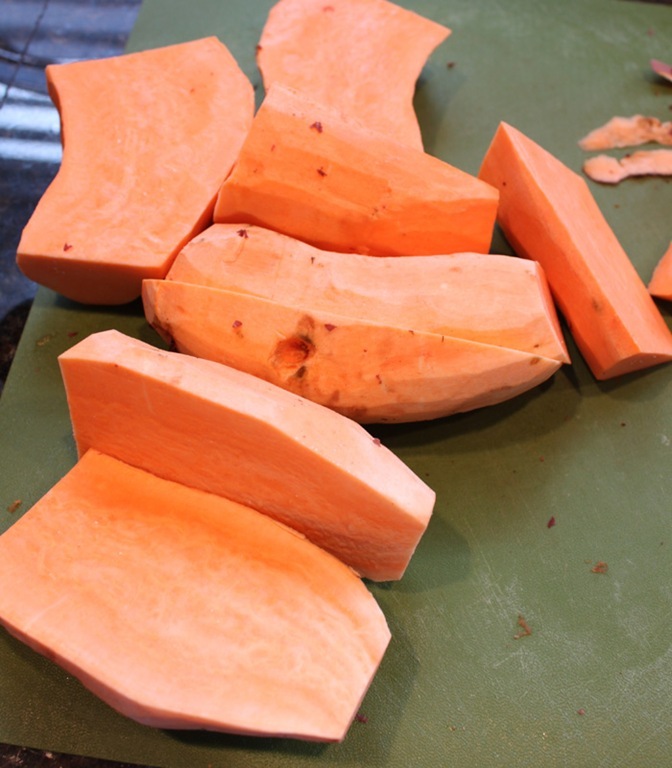 You can leave the skins on (I did with the white potatoes, I don’t recommend doing that with the sweet potatoes though) or hand grate them. It’s really up to you! 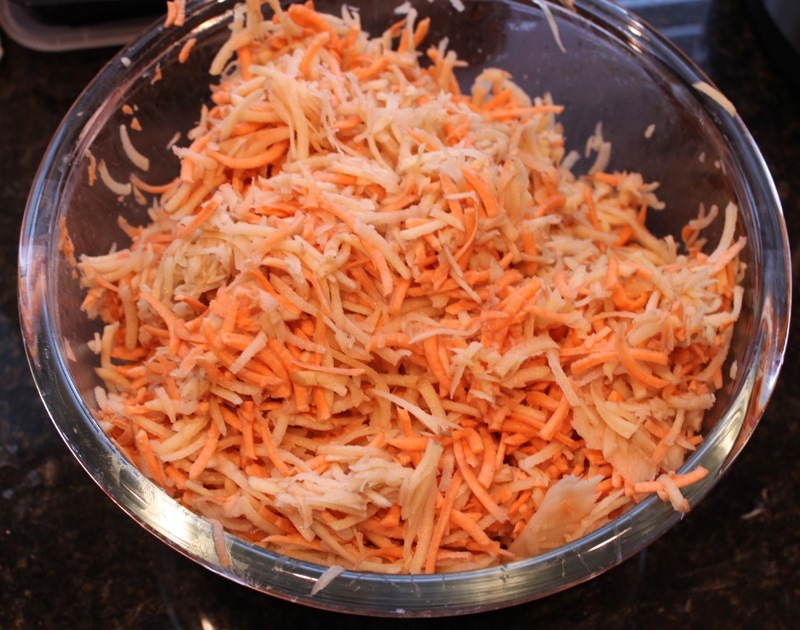 Combine your grated sweet and white potatoes together in a bowl. 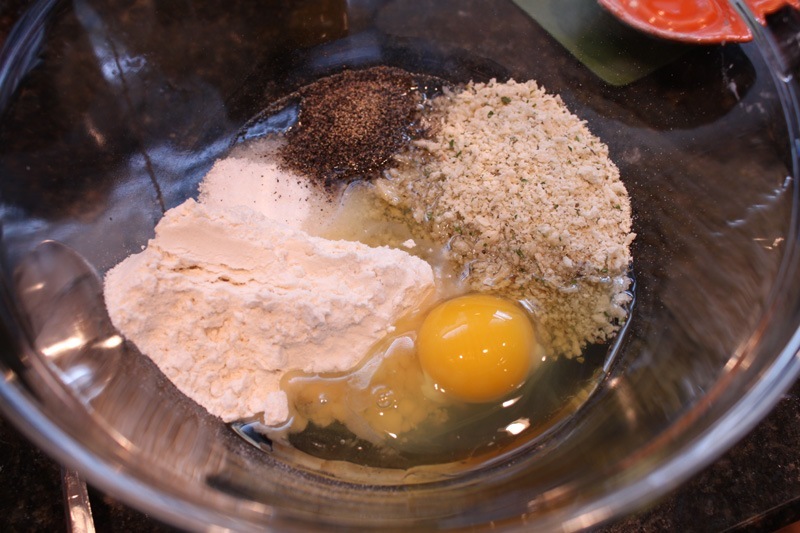 Next mix the flour, bread crumbs, egg, pepper, and salt together in a separate bowl. (A note: I like Italian bread crumbs because they come preseasoned but you could use plain or panko if you like.) 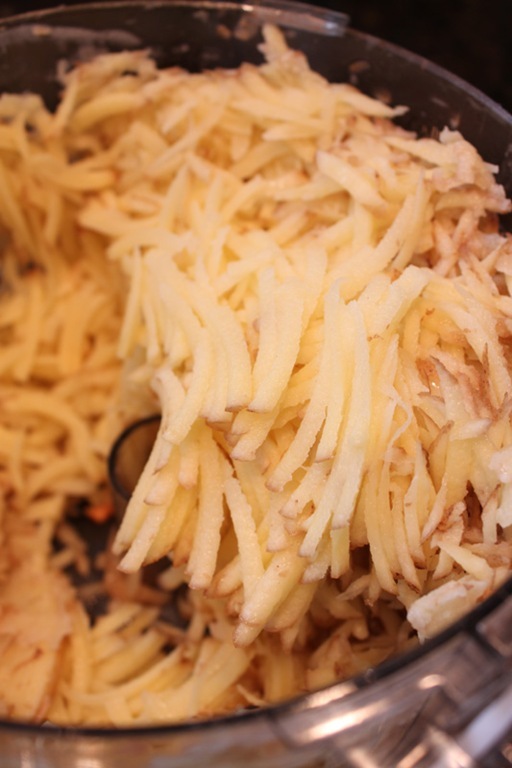 Add your grated potatoes to the mixture and combine thoroughly. In a large saute pan heat 1/4 cup of canola oil over medium heat. When it starts sizzle drop in your latke(s). 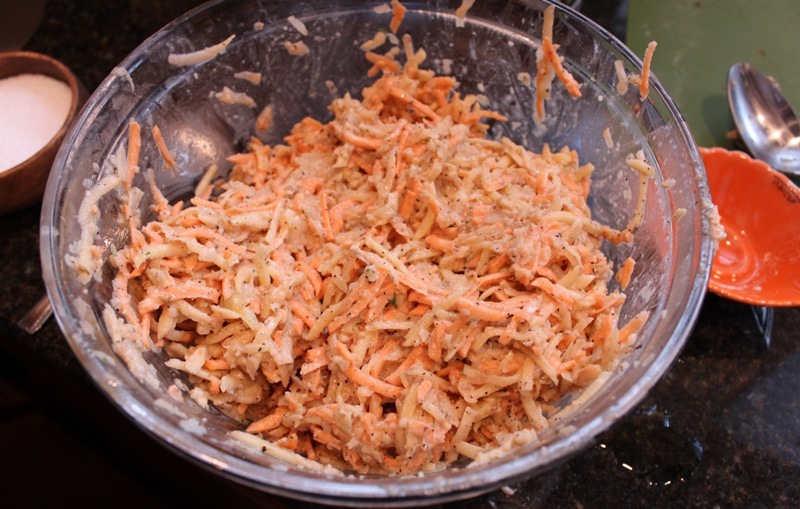 Each latke should be roughly about 2 tbsp. of your batter formed into a little patty. 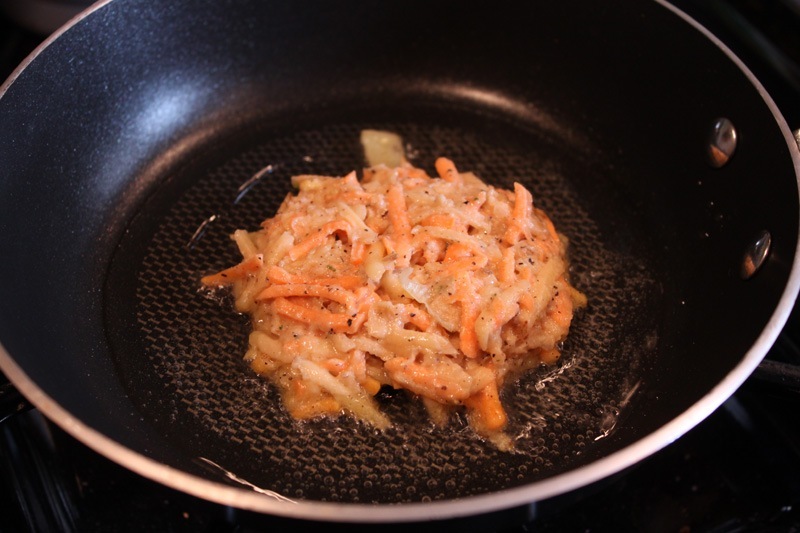 Fry in the oil until the edges brown then flip. 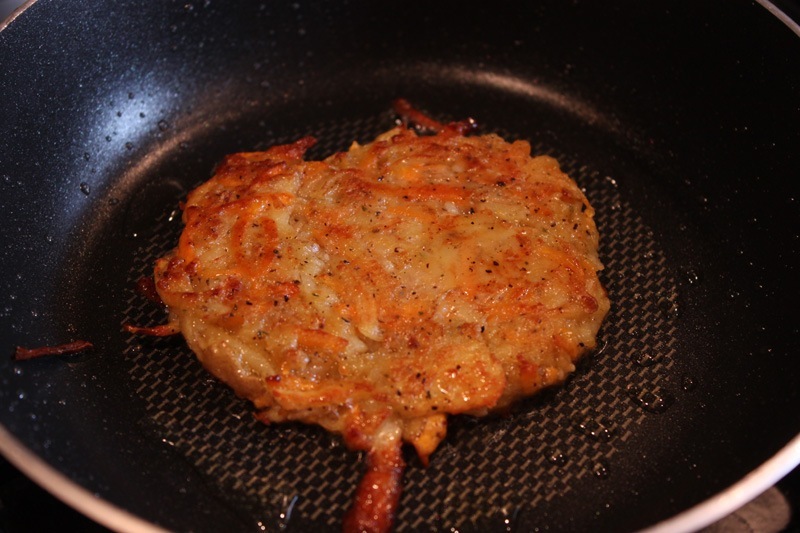 You can press the latkes down slightly to help form your patty. 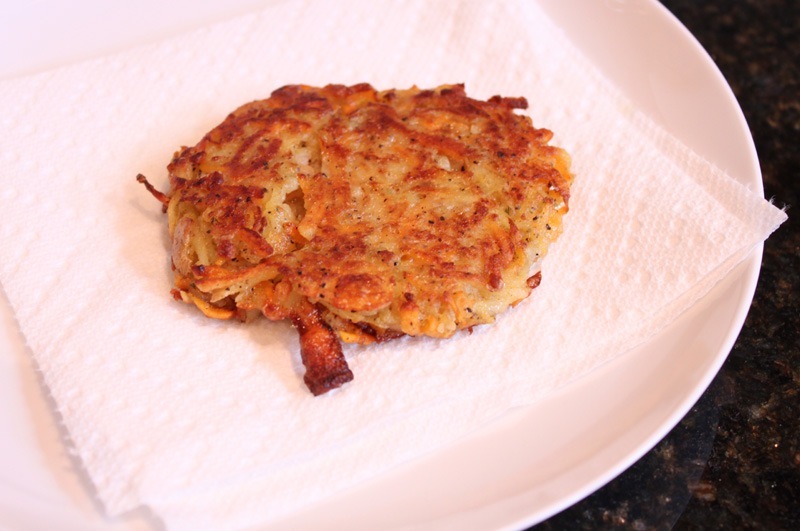 Thin latkes are better than thick ones, they crisp better and cook more uniformly through the middle. You can cook them individually (shown) or 4-5 at a time in a bigger saute pan (which I recommend). When you remove the cooked latkes put them on a paper towel lined plate to wick away the excess oil. As you cook your batch keep track of the oil level, if it gets too low just add a little more. 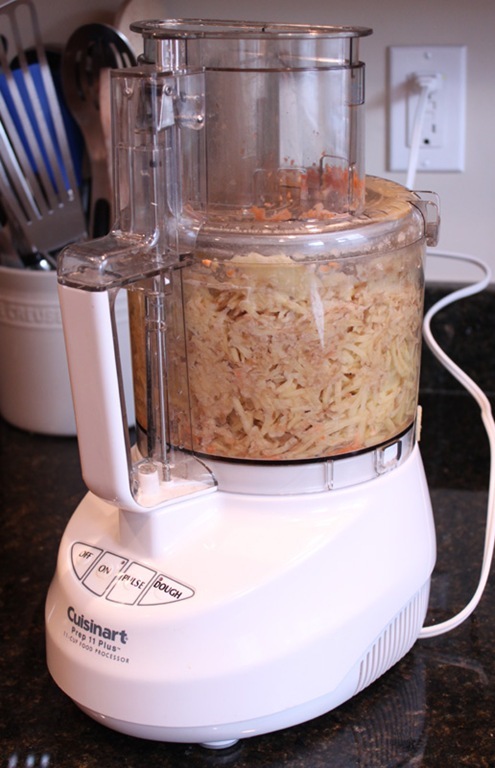 You don’t want to add so much oil that they get soggy, just enough to immerse the bottom and crisp them. You’re looking for about 1/4-1/2 inch of oil in the bottom of the pan at all times. 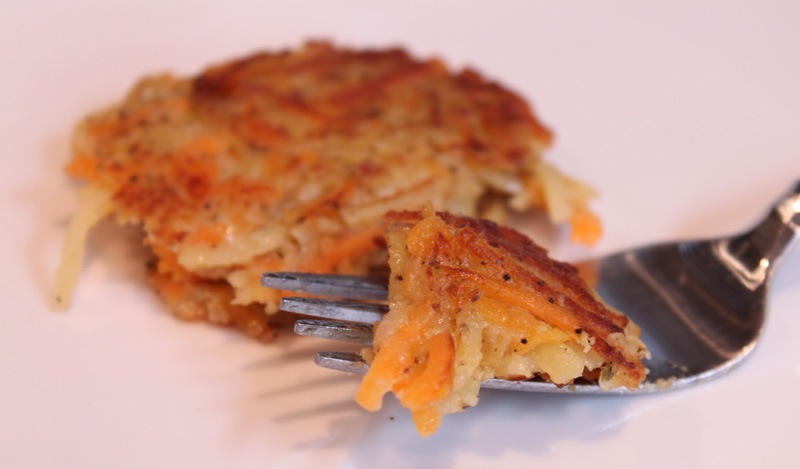 These latkes are savory and hearty, but very light. The two potatoes compliment each other perfectly and the hint of onion brings it all together. Serve hot as is or topped with greek yogurt!